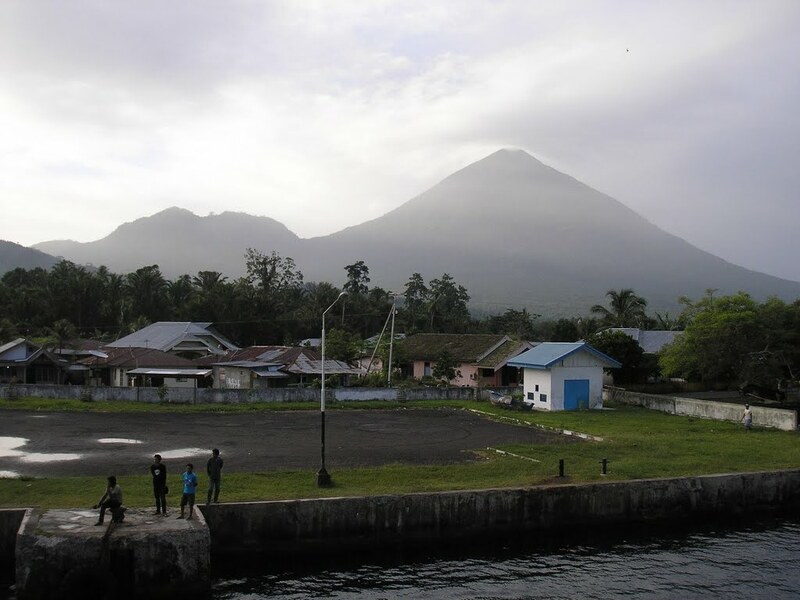 The island of Tidore consists mostly of this now dormant volcano and many people still refer to it as Mount Tidore or Gunung Tidore. Kiematubu is featured on the Rp 1000 bank note and is a beautiful symmetrical cone shape especially when seen from Ternate island. 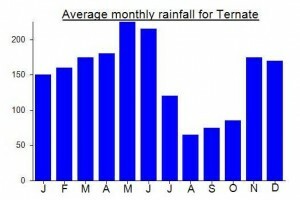 Interestingly, it is slightly higher than Ternate’s legendary Gamalama volcano yet easier to climb due to the higher trailhead. 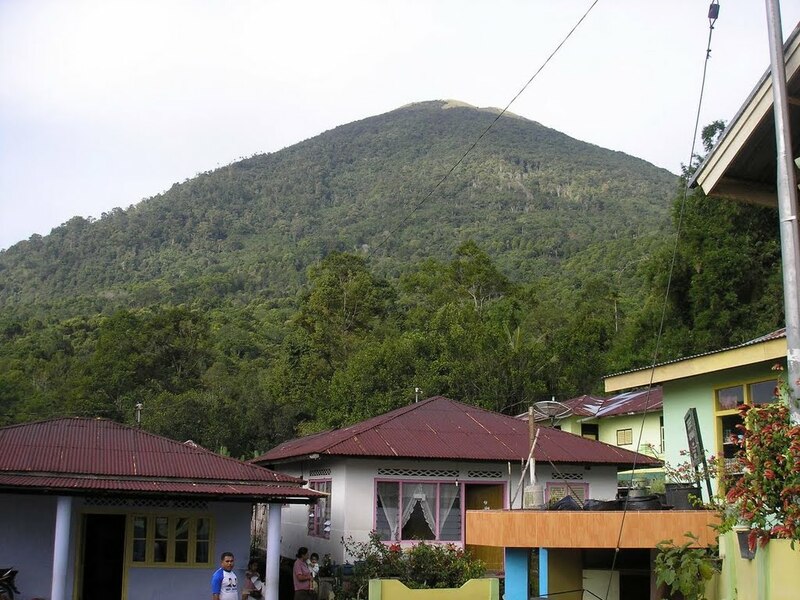 The starting point is the hill village of Gurabunga which lies roughly 600 metres above sea level and can be reached via ojek or car from the island’s main town of Soasiu. 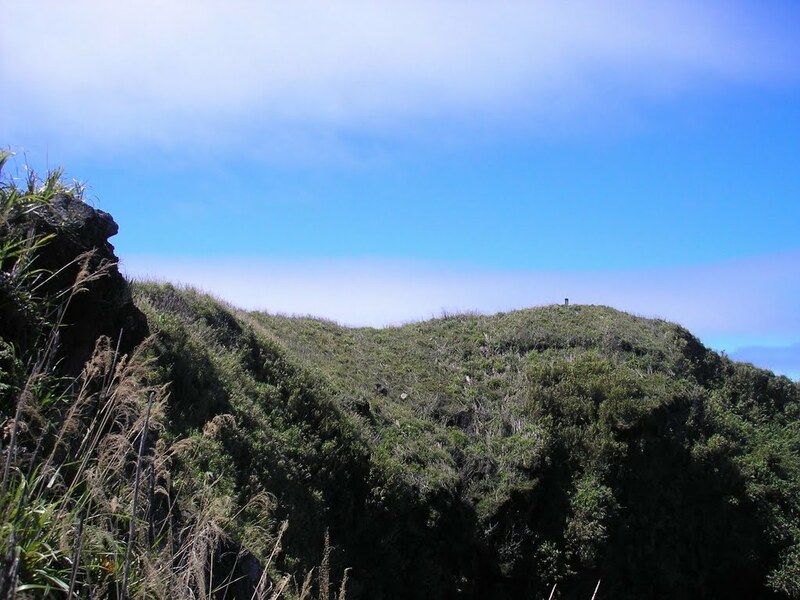 This high start means that strong hikers can get to the summit in under 3 hours and descend in just over 2 hours. 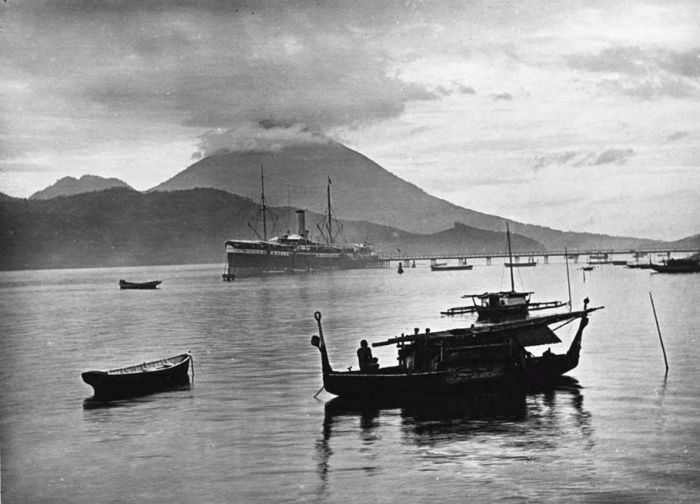 If you are staying in Ternate island, the first ferry leaves for Tidore at 7am and the last one returns to Ternate at 5pm. Additionally there are local private boats but you could easily spend hours negotiating a reasonable price. It takes less than 1 hour by car/motorbike to reach Gurabunga from the ferry port but that should still leave you enough time to climb Kiematubu as a day trip to the island. If you have met a good driver in Ternate, it is a good idea to take him over to Tidore for the day in order to save time. You will know have arrived in Gurabunga from its very nice football pitch. Stop by the mosque on the other side of the road from the football pitch and ask for a guide. The going rate appears to vary considerably – between Rp 100,000 to 300,000. Since the trail up the mountain is very straightforward, a good option is hire a guide only to help you navigated through the farmland to the “kaki gunung” or true starting point. This service should cost as little as Rp. 50,000. 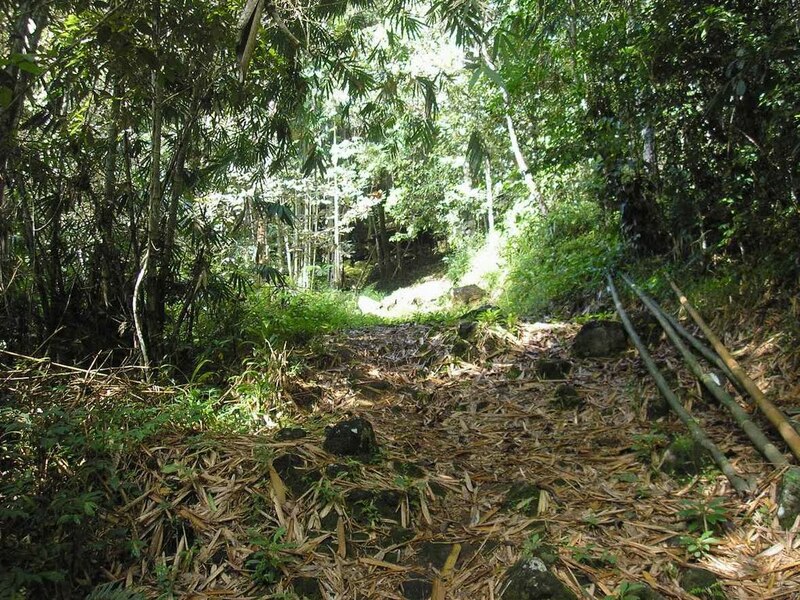 The trail up Kiematubu through the forest is quite steep, but not eroded and in good condition. There’s a bit of trash/litter but it’s not too bad. You should reach the edge of the forest after about two hours, 3 hours for slower hikers. At one point near the beginning the track widens out to almost the width of a car. You need to make sure you take a left turn next to a nutmeg tree about 50 metres before a wooden hut. This smaller trail descends slightly before ascending steeply up the side of the mountain. After two hours of hiking, the route follows a small stream running down from the peak. There is usually water to be found at this point. After the edge of the forest, the vegetation is mostly comprised of ferns, shrubs and reeds. 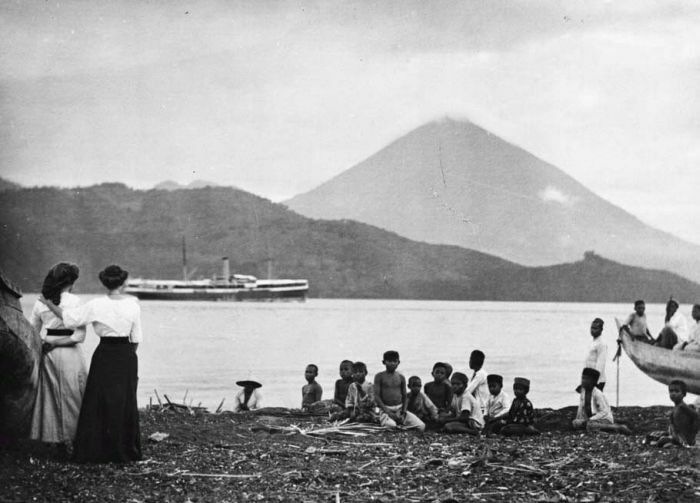 In clear conditions you should be able to see the volcanic cone of Gamalama to your right, Gurabunga village way back down the track, plus Kie Besi volcano (in the distance on Makian island) and Halmahera to your left. It is just over half an hour from the edge of the forest to the edge of the dormant crater. 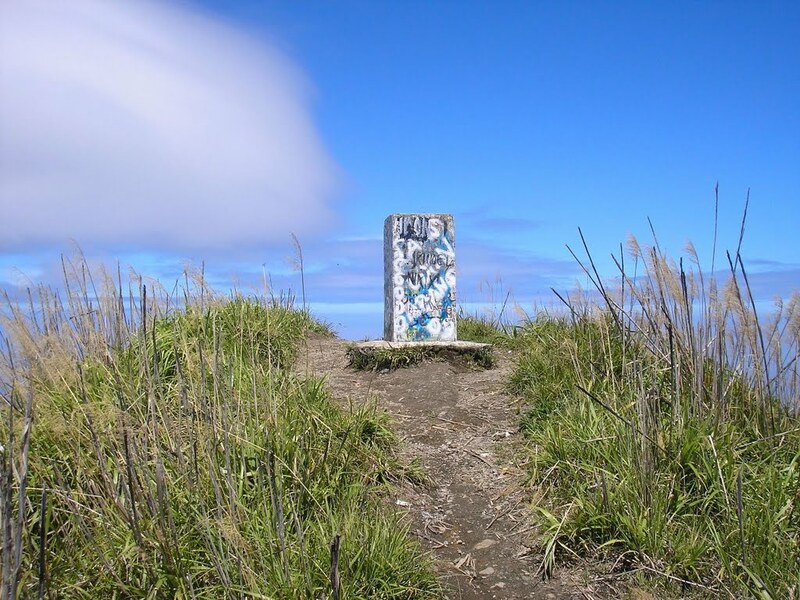 It is then a pleasant 10-15 mins hike around dormant crater summit to the summit, which is marked with a graffiti-covered cement pillar. The cliff edge of the impressive dormant crater is very steep and now overgrown with plant life – the steep drop down to north is quite amazing. The panorama from the peak is fantastic and there is room for 3 tents in between the reeds. Return the same way in just over 2 hours. Getting there: There are plenty of flights to Ternate island from Jakarta (usually via Manado and/or Makassar). 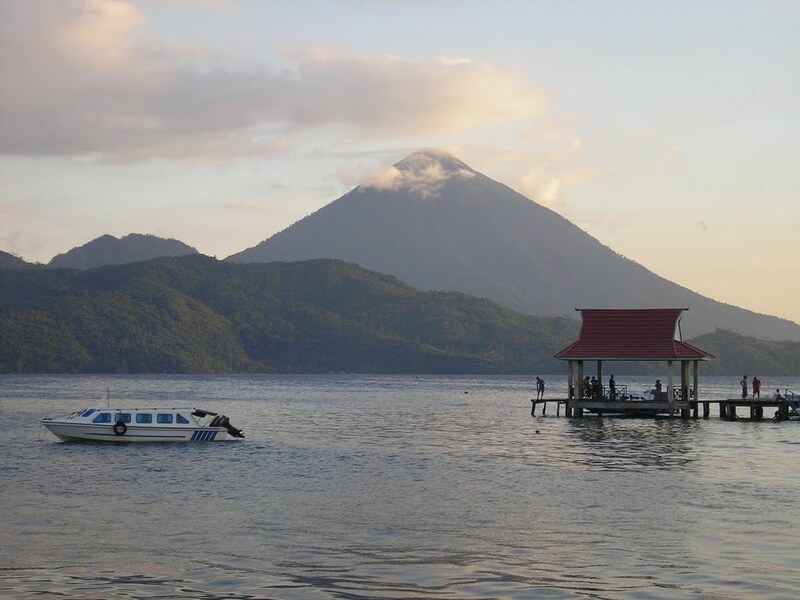 From Ternate town, take a car ferry over to Tidore (daily between 7am and 5pm) and go to Gurabunga by ojek. 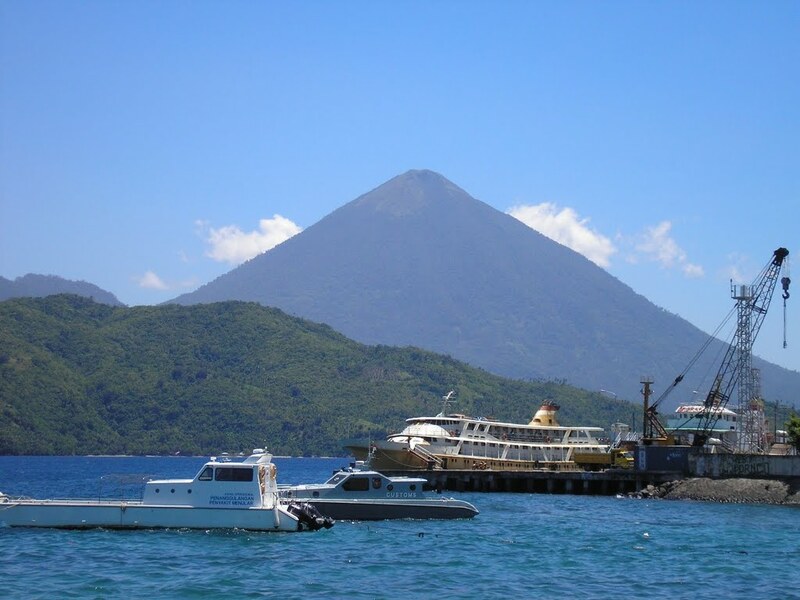 It is a good idea to hire a car and driver in Ternate and take the ferry. 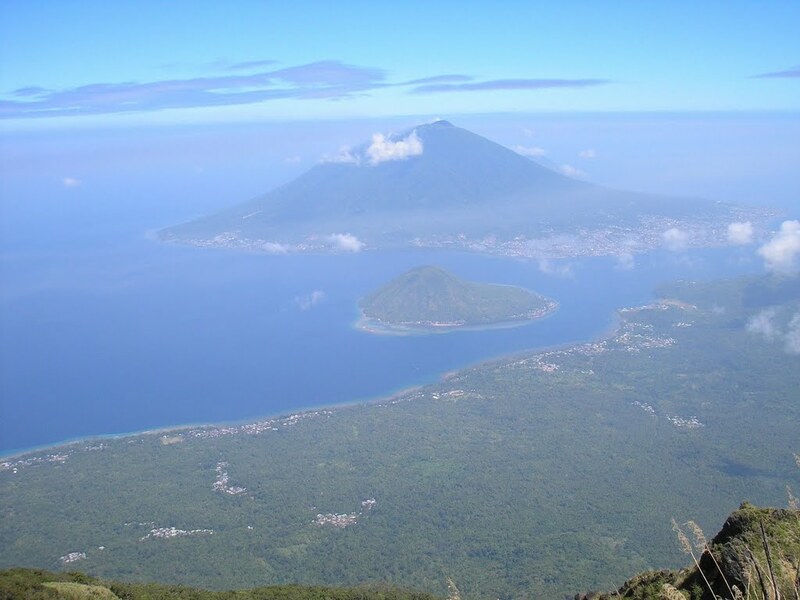 Accommodation: There is some basic accommodation on Tidore island, but Ternate town offers a better selection. Permits: None required but take a photocopy of your passport photo page just in case. Water sources: Limited supplies usually available halfway up the trail. 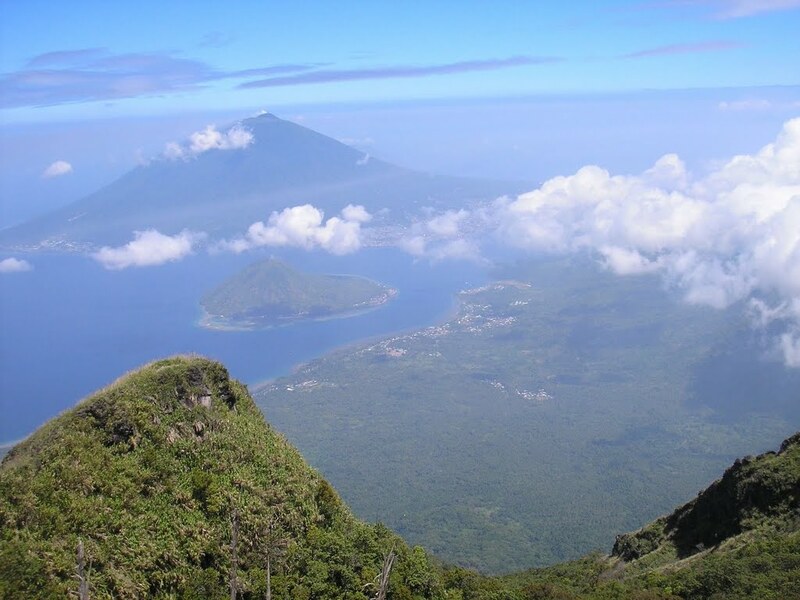 There are several guesthouses on Tidore and you can get to Gurabunga (altitude 650m) using public transport. Any angkot, ojek or bentor (carriage-pushing motorcycle) will get you to the crossroads in Soasio from where the road goes up to Gurabunga. The first angkot heads up to Gurabunga between 6.30 and 7 a.m. Ojeks can’t get you up the steep gradient, unless you find a trail bike or similar with extra oomph in the engine. My guide from Gurabunga, Haris (hp: 085298047896), was thoroughly recommendable and very friendly. The trees on this trail are heavily laden with signage as there are two concurrent series of “pos”. One, lettered in black on orange, runs from 1 to 8, while another, written in yellow on red, runs from 1 to 5. The key pos is pos 3 (black letters) at 935m, where you turn left into the forest just before the wooden hut. We had good weather going up but a heavy rain shower started within minutes of our reaching the summit. There are several clearings in the reeds around the crater rim, enough camping space for a whole platoon. Ascent time was 3h30 and the same for the descent. You might have to wait 30 minutes or so for an angkot from Gurabunga back down to Soasio. I bagged Kiematubu on November 7. Finally reached a summit after several missed attempts due to exhaustion, weather and altitude sickness. I stayed at Losmen Kita in Kota Ternate and asked everyone at the hotel whether they know someone who could guide me. One of the hotel workers put me in touch with a young student who’s studying English at the local college. I told him I wanted to climb Kiematubu, Gamalama and Maitara. He said he’ll make the appropriate calls first concerning mountain closures, etc. He informs me the next morning that Kiematubu is closed “because the sultan just died” (yeah, that was puzzling to me too), and Gamalama is closed because of activity, so we were left with Maitara. When we got to Bastion harbor, the sight of Kiematubu’s perfect shape in the distance was simply too enticing. I urged my guide to ignore what he was told and “let’s just wing it and see what happens”. We could always go to Maitara from Tidore if Kiematubu turns out to be closed. I ended up paying for the entire boat for the short ride to Rum harbor on Tidore. We got two ojek at Rum to take us to Gurabunga. It was a beautiful morning but I could see clouds gathering on the summit. Then my incredible luck played out once again! I and my ojek driver were successfully negotiating the zigzagging road up on the mountain when the motorcycle suddenly stalled at an especially steep section. We rolled backwards and then we both fell to our right. I bruised my right palm and there were nasty scratches on my right elbow when I had to brace myself against the concrete surface. I wasn’t about to get back on that darn motorcycle so I walked the rest of the way to Gurabunga. Might as well continue…although my right palm was hurting pretty badly. It seemed as if we arrived in Gurabunga early. The town had not stirred yet. We asked some locals whether there’s a store where we can buy bread but there was no one around. We were then invited by several families to sit on their porch (near the football pitch). One lady very kindly offered us homemade cakes and mint tea. That set the tone for the rest of the day. There was a lot of back and forth talk between my guide – who’s from Ternate and has never been to Kiematubu’s summit – and the locals. It was finally decided that my ojek driver would also accompany us as a second guide. Both he and my Ternate guide got explicit directions as to where to go. They were both confident enough that we’ll summit that morning so I readily agreed. Actually I had no other choice. The trail starts at the back of some houses. Be sure to check out the graves just behind the houses. The first hour goes through planted fields and some sort of nutmeg orchard. That was the first time for me to see nutmeg trees. I wanted to walk to the house at the junction where you have to turn left by the nutmeg tree (that Dan describes above), but my guides said no and translated the “no trespassing sign” nailed to a tree nearby. Although it was easy to follow the trail, it was a hard slog up the steep terrain. 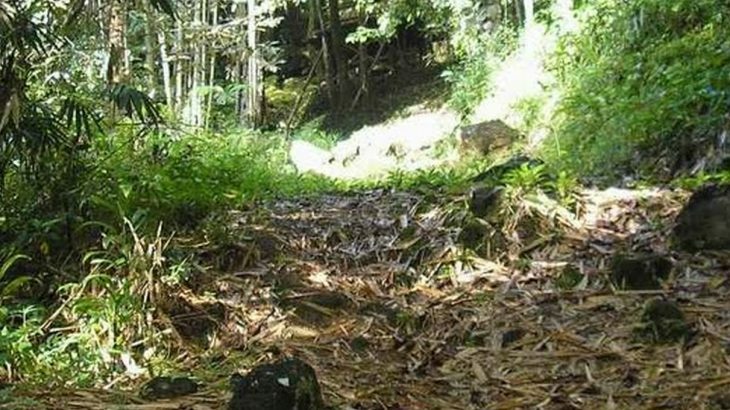 Pos 2 – pos 8 covers the entire forest trail. It rained for about an hour so the trail became slippery and I started to doubt the wisdom of climbing the mountain that day. Around pos 6 you would notice as you look up at the forest canopy that you’re nearing the edge of the ridge. It turned out to be a false sensation as the summit is still around 1.5 hr from pos 6. It’s after pos 8 that the terrain changes to slippery rock. Keep an eye out for pitcher plants lining the trail. 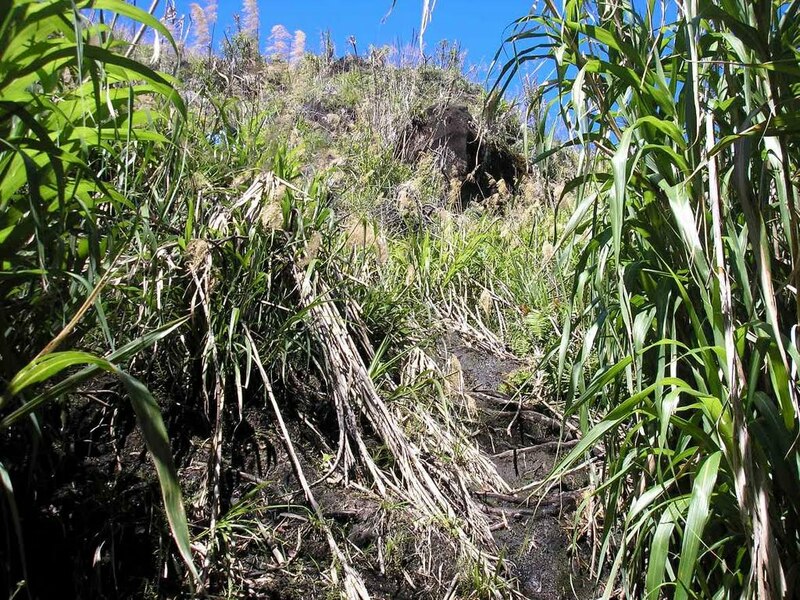 After about 3 hours we were finally out of the forest and negotiating the winding trail towards the summit, first on rock and then through high cogon grass. To my disappointment, what would’ve been a stupendous view was completely covered by clouds and fog. It was quite windy and there was also a slight drizzle. We reached the summit after about 20 minutes from the forest’s edge. We didn’t linger long (~15 min) because of the wind and drizzle. I made a mental note to return and re-bag this gunung during the dry season. The walk down was made more treacherous by the rain and the slippery trail. I re-bruised my right palm after slipping twice. We were finally back at Gurabunga after 4.5 hours. The other ojek driver (who drove my Ternate guide) was there waiting for us, and invited us to have breakfast at a local family’s house. I met the entire family, and even with my limited Indonesian I was able to communicate with everyone. The hospitality of everyone I met in that village was the high point of my experience. So in spite of my bruises I came out of it very satisfied. I and my Ternate guide switched ojek drivers! The two drivers had a laugh over that. We took the longer way back. In the end it was a wise decision not to take the same road back to Rum port as we traveled on the island’s ring road where the views are amazing: Kiematubu to the right and the sea and neighboring islands to the left. Java Lava group did Kiematubu on Sept 11 2011.3-3.5 hrs up, 2-2.5 hrs down from Gurabunga, which is at just over 600m, not 900m. 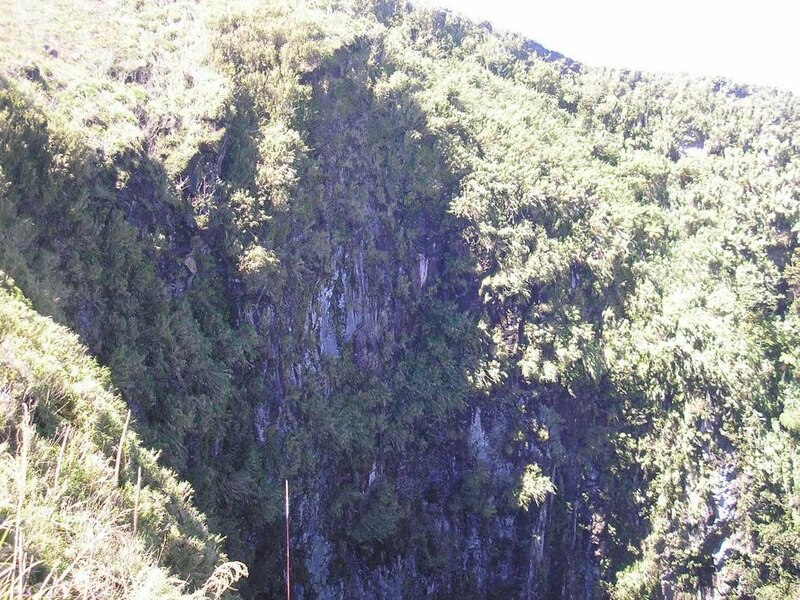 So its +/-1100 m vertical climb.